In its Third Edition, American Regional Cuisine combines history, anthropology, and cuisine into a clear and comprehensive resource for the American Regional course. 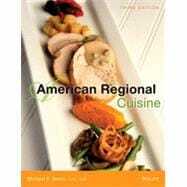 It features sweet and savory recipes of the most popular and memorable dishes from eleven regional culinary traditions. Organized by region, these recipes are drawn from every part of the menu, offering a range of complete meals for each culinary style. Its menu-driven approach is unique, and new to this edition will be more information on fair and festival food, and a new more contemporary menu included in each chapter. The 3rd Edition of American Regional Cuisine adopts a new focus on sustainability as it relates to the culinary industry, incorporating areas on green cuisine and sustainable food practices. Each traditional regional chapter is now complemented with one new contemporary menuand accompanying recipes for added diversity. Menu coverage also includes new information on how the menus were developed and why any special ingredients were used in their development.